Welcome to our web-home! Our names are Karen and Mark Pino, and we are piano teachers in Ashburn VA.
We are both graduates of Westminster Choir College, a prestigious music school located in Princeton NJ (and we are proud to say that our son Alexander is now a student there!). 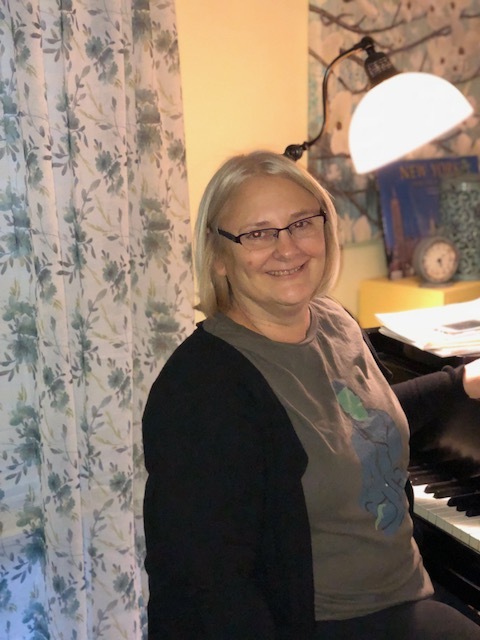 Each of us have over twenty-five years experience in teaching piano privately, and Karen also has experience in vocal coaching. We also have varied experiences in choral directing, bell choirs, piano accompanying, elementary school music teaching and playing in various church bands. Our home studio consists of a beautifully restored 1925 Chickering full grand piano, a restored 1926 Steinway upright piano, and various electronic keyboards for group workshops. At least once a year we also have access to the Fairfax-Loudoun Music Fellowship's single manual Franco-Flemish harpsichord, which our students are able to take lessons on, and use in a recital/workshop. "So many people separate music and music-making from what life is all about and treat it as an 'untouchable' thing. But it's nothing more than the projection of the feelings of a human being. The responsibility of expressing these ideas to my students is a marvelous experience for me. If I can help them to see the total picture, they'll know that music isn't intangible. It's very real — as real as anything can be." Letting students learn this lesson, to reach their potential, and teaching them to enjoy all music while doing it - that is our philosophy! However, please bear in mind that no two students are exactly alike, and children (as well as adults) learn at different rates of speed. Even brothers and sisters within families differ radically in motivation and temperament. Therefore, we approach students as individuals and attempt to challenge each according to their own unique potential. Music is not easy, and may not always be "fun". However, given sufficient time and structured practice, it does become enjoyable to master the many different aspects of this art.